Seven weeks after the SF Municipal Transportation Agency painted red transit-only lanes on several blocks of Church Street, Muni reports that the J-Church and 22-Fillmore lines are moving faster and more reliably. On the stretch between Duboce Avenue and 16th Street, travel times on the two lines have dropped by 5 percent, and the buses and trains are 20 percent more reliable, arriving closer to their scheduled arrival times. The Church transit-only lanes are a pilot project of the TEP that allows the SFMTA to measure the effect on transit and traffic, helping to inform plans to use them on other streets. 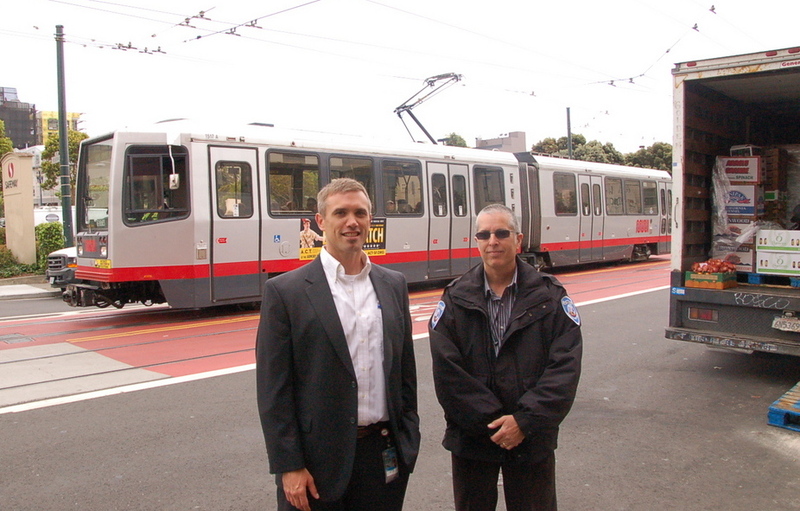 Sean Kennedy (left), the SFMTA’s TEP planning manager, and Cameron Samii, SFMTA enforcement director. While it’s still easy to spot drivers disobeying the new rules, it appears that violators are less likely to enter the lanes in front a Muni vehicle, where they might cause delays. That seems to indicate that even if drivers know they’re driving in the lanes illegally, many seem to know better than to delay Muni vehicles. “They know,” said Cameron Samii, the SFMTA’s enforcement director. On the city’s other 15 miles of transit-only lanes (which, other than Third Street’s light-rail lanes, aren’t colored), Samii said it’s typical to see drivers pick up on patterns and only violate the lanes when there are fewer transit vehicles and enforcement officers are around. The agency tries to mix up where and when enforcement happens, he said. At Church and Duboce, a scofflaw driver enjoys a cleared-out transit-only lane while buses load at the sidewalk in the mixed traffic lane. Transit planners and advocates had hoped to see the northbound 22 bus stop at Church and Duboce Avenue moved from the skinny sidewalk to the center boarding island to take full advantage of the exclusive lanes. 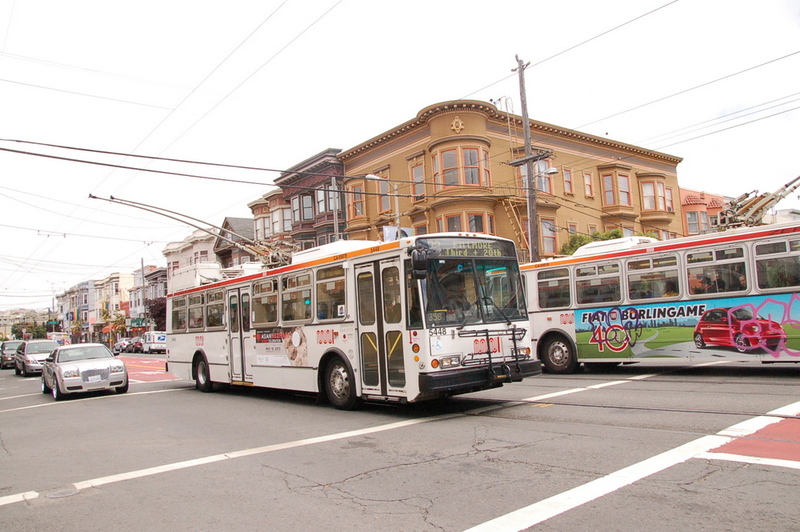 The SFMTA did make that happen around Easter, said Kennedy, but after a week, a complication in the adjusted overhead wires lead to a meltdown after a Muni driver drove too quickly through the intersection. The overhead wires were torn down, holding up the J, the 22, and the N-Judah for four hours. Kennedy said that incident occurred because the agency didn’t have enough funds to do a proper re-wiring, so planners used the cheaper method of adjusting the 22’s wires towards the center lanes just enough for the buses’ catenary poles to reach. It would have worked, he said, as long as 22 bus drivers eased through the intersection slowly enough — which Muni managers instructed them to do. However, a new bus driver apparently didn’t get the memo, and the poles on his or her bus damaged the wires enough for the next J train to tear them down. “We can’t have that happen a lot,” said Kennedy, so the 22 will continue using the sidewalk stop in the curbside lane with mixed traffic until Muni embarks on a separate project to re-wire the system properly, which would require no small amount of funding, he said. Another measure the SFMTA has taken to reduce blockages is to move loading zones where large trucks had previously blocked the mixed traffic lanes, leading drivers to get around by entering the transit-only lanes. SFMTA staff will continue studying the impacts of the transit lanes, and issue 6-month and 12-month reports on it. 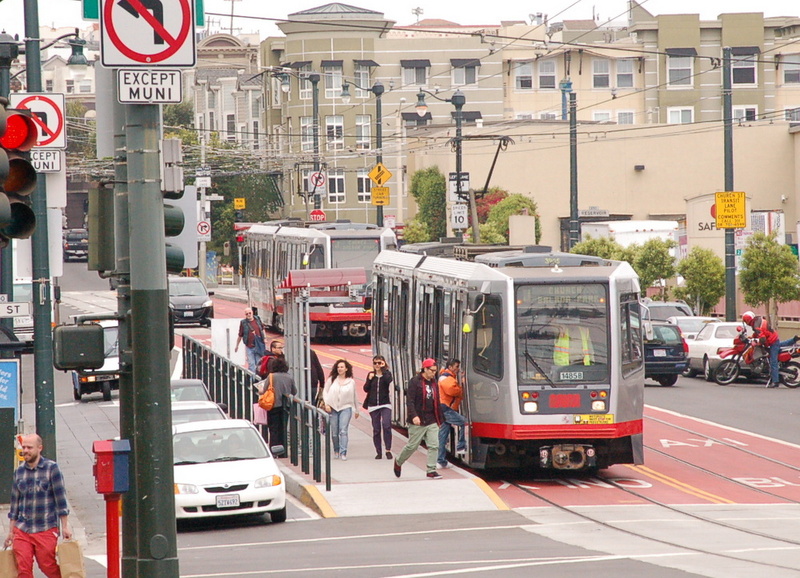 For its next red paint projects, the agency is looking to add the treatment to existing transit-only lanes on the 8X-Bayshore and N-Judah lines. 22-Fillmore buses on Church cross 15th Street. Is there a reason why the SFPD is chronically stretched so thin on officers for traffic enforcement? Even if their costs are something like $120/hr/officer, that should mean any patrol they run that issues two or three tickets an hour is self-funding (not to the SFPD, but to the city overall). If there were enough officers to monitor just the intersections in the city where you see two or three scofflaws every five minutes, the streets would be completely different. Mount “red light” video cameras on the front of all the LRV’s, and give the drivers a foot switch to turn them on. Then make the fine $100 per five seconds of delay to the vehicle in addition to the standard “No Left Turn” violation fine. I live half a block from 15th and Church and hear the booming train horns much more often now than in the last several years–train operators apparently aren’t putting up with the left-turn scofflaws as much as before. For once, well done Muni! Keep them coming! Those overhead wires immediately started having problems when the buses shifted to the center. 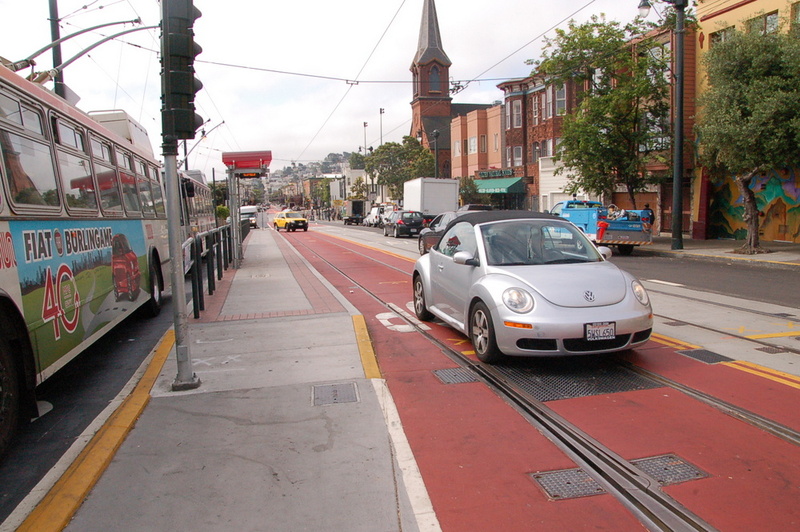 I remember seeing one go off the wires the first time I saw the new lanes, at Duboce. When left turns are permitted, can cars/bikes enter the lanes to make one? Now, how about addressing the several minutes every J, 22, and F spends at the red light at Church and Market? Every F spends 2-3 light cycles at Church due to drivers blocking the boarding islands. Eastbound Market is a freeway for solo drivers every morning — why do we make it so easy for them to speed through with timed lights, while messing up our transit? Yes, because street safety is not a priority to the SFPD or mayor. > Despite numerous signs announcing prohibited left turns at Church and 15th Street from 7 a.m. to 7 p.m.
Did MTA forget to update these signs? If the red lane is 24 hours/day, left turns should be banned at all times. The signs could be more prominent as well. Great! Time to extend the concept all the way to 30th, and all the other streetcar routes. Kennedy said yes, they can enter the lanes for left turns during permitted hours. Good to know — I envisioned people making left turns from the right lane, just out of confusion, and getting T-boned by the streetcar like in San Jose. Finally…action! (as opposed to endless talk and diversions to the Central Subway sink hole!) Muni needs more improvements like this one. That photo shows a car in the transit lane, but it also shows a bus in the car lane. Seems to me it would be a little unfair to ticket the car when the bus isn’t using it’s designated lane AND is blocking the only lane the car could legally use! Shouldn’t it be an infraction only when there is a bus or streetcar present AND the car lane isn’t blocked by a bus? All lanes are open to transit, some lanes are open to ONLY transit. Also, the overhead wires are a mess so the buses need to use the other lane for the time being. You should read the article. @Tom – There is no such thing as a “car” lane. It is called a travel lane, and it’s open to transit and bikes as well as cars. @de011f58b742a24dae0c13ebe86f71db:disqus – Agreed, though wasn’t there already a brick red treatment in the Sunset that motorists basically ignored? What do you mean “blocking”? If there is a car in front of another car, is the one in the front considered blocking the other one? Why is the bus always considered to be “blocking” traffic? Mario,I am just going by the picture which shows a bus blocking the only lane a car is allowed to use (and yes I read how that was a screwup with the wires). An analogy would be if a bike lane was blocked by a cab or delivery truck, then the bike would move into the car lane. Conversely cars sometimes have to use the bike lane for entry, exit, turns or to avoid a blockage. I would not expect a ticket to be issued in any of those situations. The other point of course is that if Muni runs through there, say, every 10 minutes, then why should that lane be banned for all other road users for the rest of the time? Steve, If you start running SFPD like a profit center (and DPT is already run that way) then cops will never respond to break-in’s, assaults or any other incident that doesn’t result in a ticket. The bus is not *blocking* the lane. The bus stop for the 22 is on that lane. It’s analogous to cars backing up at a stop light with a single lane of traffic. That doesn’t mean you can drive on the sidewalk around the cars to make a right turn – you still are required to queue up behind the cars and wait until the other vehicles clear before you can make your turn. The bus handles way more passengers than the measly car driver who can’t wait. The bus just moves slowly and sometimes stops a bit longer than cars, but it’s not an obstacle blocking traffic. It’s just a more efficient way to transport people, yet a less efficient way to transport vehicles. How about indemnifying the DPT parking officers to ticket moving vehicles going through lights and stop signs, distracted drivers, etc.? Glad to see this nightmare intersection is finally being dealt with. But there’s still no traffic light at Church and Duboce and people and cars constantly play chicken with MUNI, the result being slowed down trains. I’d like to see a light and even better, no cars in that particular (small) area. The trouble is that what I hear from engineers is that a traffic light may slow down Muni further because a traffic light is less flexible (even with transit priority) than a stop sign, considering there are two lines crossing. The right answer as you say is to remove cars from those intersections, but that doesn’t seem to be in the cards. All they had to do was move the 22 bus line into the center and they would already have saved some time with the 22 and J line. Most drivers hate getting caught up behind a bus stopped at an island. That alone would have been enough. Changing and coloring lanes throughout the city means nothing and accomplishes nothing. Muni has always been late at least for the past 20 years. Stop lights, autos, pedestrians, cyclist and the time it takes for typical bus riders to get off and on the bus including some with bikes are never factor into any argument. Or what about when a bus stops in the middle of the street at a bus stop instead of actually stopping in the bus stop and I mean fully in the bus stop not at a huge angle leaving the back end of the bus blocking a lane and holds up traffic for blocks while another bus line behind it gets caught up in that same traffic 5 blocks down?????? That’s besides the fact that they are always cutting back on their lines. THIS IS A METROPOLITAN CITY!!! You will always have buses,pedestrians,cyclist, cars trucks and deliveries. SMTA = Bunch of confused idiots believing they’re dumb ideas will really work. Things are just going to get worse for everybody and Muni will always been running late if not worse. Start with your drivers and work from the inside out. Not from the outside in. Most drivers hate getting caught up behind a bus stopped at an island. Two solo motorists, 30+ bus passengers. Apparently you missed the point. Amazing blog we have here. This comment made on post about removing autos from the equation. TEP will address stop distance (dwell time) and signal timing. But you are a native, so you much know what is best. It’s Simple. Deal with the lazy bus drivers. Force all bus drivers completely into the bus lane allowing traffic (cars&bikes) to flow and improvements of boarding. Results of the clipper card have yet to be seen. As far as TEP I have no faith in them as well as no faith in many other city departments. City hall gets too involved in all the different departments making it harder on them to do to the right thing and get their jobs done. If they moved themselves out of it and only into oversight then maybe. However…. If your a bus rider then wonderful. Let me know if the colored bus lanes work out for you. That’s too bad. It seems there is no new thinking and no co-operation. Between cars, bikes, skateboards, etc. you take your life in your hands walking in this city. But some walkers (and drivers and bikers) selfishly play chicken at the corner of Church and Dubose and since there’s no red light there, the passengers on the J and N pay the price.